Rum & Butter was our principal name but were also known around Tamworth as 'Cargo' because our agency in Tamworth (Brian Yeates and Ken Price) thought the name Rum & Butter was too corny for some clubs/gigs. For their more 'rocky' gigs they generally booked us out as 'Cargo' and used the name 'Rum & Butter' for dinner dances, weddings and similar. I would say that 90% of our gigs were under the name Rum & Butter. The line up was therefore the same for both bands. 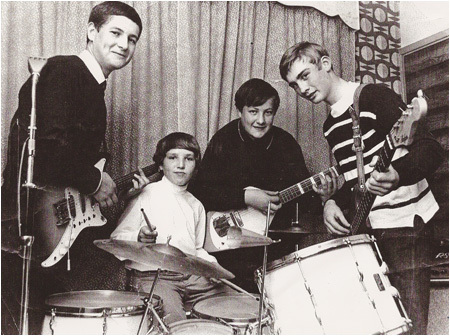 The band started around 1967 with the above line up. Andy Britton left the band in 1972 and Alan Taylor moved from rhythm guitar to bass guitar at that time and we continued as a three-piece. Roger Panton replaced Steve James on drums in 1973 and I eventually left the band around 1974. Rum & Butter had a good reputation around the Midlands and played most of the social clubs and all the big night clubs in Birmingham including Rebecca's, Club Cedar, Whispers NightSpot etc. and often supported some of the big name bands. For example, we played a week supporting Billy Fury plus we did gigs as support to Black Sabbath and the Troggs. We also played most of the clubs around Tamworth on a regular basis because one of our agencies: Brian Yeates / Ken Price were based in the centre of the town and booked most of the Tamworth clubs. e.g. Two Gates, Glascote WMC, Hurley WMC etc. We were booked at Susanna's at the Castle Hotel the night it opened as a restaurant and music venue. We remember that they were still painting the stage area as we were setting up and doing our sound check! The paint was still wet when we went on to play our first set so we could not touch the walls or woodwork! We played Susanna's regularly in those days and I have a newspaper advert for Rum & Butter showing that we played there on Jan 11, 12, 13th, 1973. I also have an entrance ticket for the evening Rum & Butter played at Drayton Manor Park on Fri 26 October 1973 in aid of Lichfield and Tamworth Deaf Children's Society. We played a lot of gigs in and around Tamworth at that time but those are the only relevant keepsakes I have from that era!